Today (MLKJ Day), I have been thinking about those who came before us and paved the way for the freedoms and rights that Americans, particularly African-Americans, have today. I have been thinking, in especially, about those who saw injustice and spoke out and worked against it–who changed this country for the better during the Civil Rights Movement. They made physical change happen (reduced violence against African Americans, integrated schools, buses, workplace, voting, etc. ), but they also changed the soul of America for the better. My (maternal) grandfather influenced my beliefs and values, especially regarding social and environmental issues. He was quite liberal (for a white man in the rural South) and despite conventional wisdom, he got more liberal as he got older. He was on the county Board of Education when Brown v. Board went through (in 1954) and he immediately campaigned for integrated schools in the county. This was met with a lot of resistance–there was even a cross burned in his yard. But, he stuck with his ideals. He told me later that not only did he think the county Board should have obeyed the highest court in the country, but that it was “just the right thing to do”. However, the high school in our county did not fully integrate until 1970. I think because he could not make the change he wanted, and he was farming full time, he did not run for Board of Education again (maybe he also knew he would not get re-elected! ), but he continued to speak out against unjust political policies. So, here’s to those to came before, who spoke out in the cities of the South and endured violence, and who were heard on the national stage and changed the country . . . and to those in small towns across the country who made a stand and were not heard, but who still influenced, for the better, those who came after. 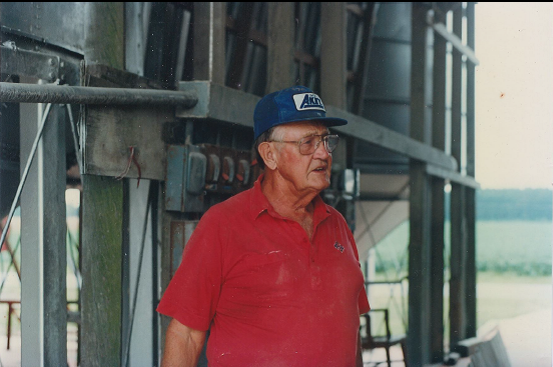 My grandfather, Hythe ‘Pete’ Reid, at his farm (2000). i love this picture of Daddy. Brought tears to my ears and memories to my heart! Glad to bring back memories!